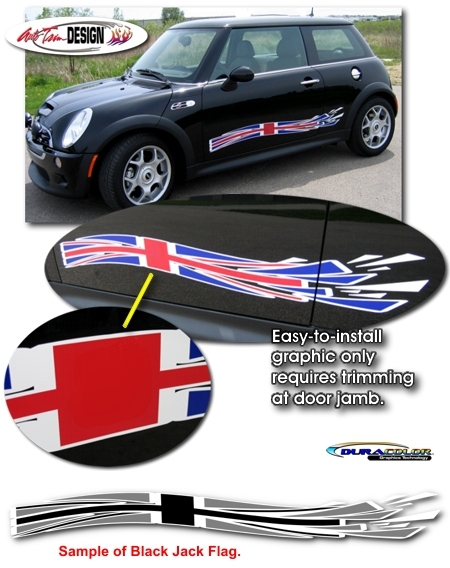 Trick out your Mini with these awesome Union Jack flag body side graphics that feature a unique break-away design! Available in one of two (2) color schemes (Union Jack and Black Jack), graphics are digitally printed with our DuraCOLOR graphic technology with a high definition image onto premium automotive grade vinyl film materials. As a further step, graphic is covered with a 2 mil clear Gloss or Matte laminate which provides protection from miles of abuse. The Graphics are packaged as a set of two (2) - one for each side and fit a wide range of Mini vehicle models (see Graphic Size Chart below).